Marking part number, diameter and country of origin. Thickness of bearings can vary within the same production line. 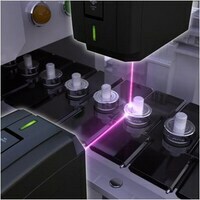 By using a 3-axis laser marker, changeover will be no longer necessary. If the bearing becomes smaller, mechanical stamping will damage it. Reduce man hours for changeover and reduce damage by using our laser marker Z-height.